Reveal a fingerprint using iodine! 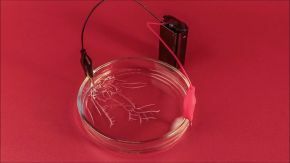 This experiment is included into "Diffusion" kit along with "Chemical reefs" and "Iodine diffusion". Subscribe and get everything you need to do this experiments at home. I've waited 10 minutes, but my fingerprint still hasn’t appeared. The iodine might be evaporating slowly due to low temperatures. To increase its evaporation rate, try gently taking the cup into your hand. The heat from your hand will help increase the concentration of iodine vapor. But in most cases, the fingerprint itself is to blame; see the next tip for more details. How can I make the best possible fingerprint? The main factor influencing fingerprint quality is the amount of grease on your finger. If your finger is too dry, your fingerprint will not appear. In this case, wipe your forehead one more time (this will make your fingers greasier) and try the experiment again. If your finger is too greasy, the fingerprint will materialize as an amorphous and ambiguous stain. In this case, don’t wipe your fingers at all, or even wash your hands before repeating the experiment. One prepared solution should work fine for at least two tries. Potassium iodide KI contains iodine ions I−, which we can turn into iodine molecules I2 using CuSO4. Unlike criminals, we want to be sure to leave some fingerprints. Iodine is quite volatile. This means that its molecules leave the solution easily and disperse as a gas. Iodine sticks to fats really well, and our fingerprints are mostly made of fats. Iodine vapors are absorbed by fats contained in the fingerprints left on the paper. 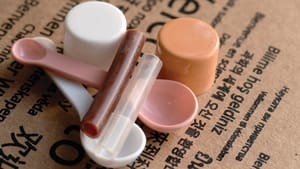 Iodine reveals the fingerprints by coloring them characteristic brown. Potassium iodide KI contains iodide ions I- , which are basically iodine atoms with an extra electron , and CuSO4 contains a Cu2+ ion , a copper atom with two electrons missing. Cu2+ can take an electron from I- , turning it into I0 . The latter likes to bond in pairs, forming iodine molecules I2 . When these iodine molecules form, our solution turns brown. Iodine is rather volatile and can easily escape a solution. But there are plenty of things all around that iodine molecules can stick to. For example, iodine dissolves very well in fats, and fats are what fingerprints are mostly made of. Even the small amount of fat from our fingers can host enough iodine molecules to make otherwise colorless fingerprints dark brown and clearly visible. Even though there are plenty of other methods for revealing invisible fingerprints, this one is particularly helpful when dealing with rough and porous surfaces like paper. Forensics experts use it to help catch greasy-fingered criminals even today. How is the fingerprint revealed? Iodine molecules escape the solution easily at room temperature, and iodine vapor begins to fill the plastic cup. The iodine vapor permeates the residual oils in the fingerprint, lending it a visible brownish tint. 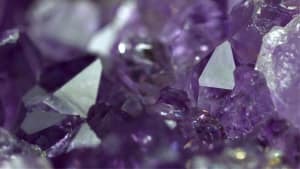 Under normal temperature and pressure conditions, iodine is a solid crystalline substance with a metallic luster. However, it is volatile, meaning that it sublimes easily. And iodine can also vaporize from water solutions easily. Because iodine molecules (I2) are nonpolar, they dissolve poorly in water but are soluble in nonpolar solvents such as oils. The net, or total, the charge of a molecule of any substance is zero. 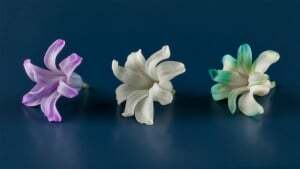 However, the positively- and negatively-charged fragments can be unequally distributed within the molecule. When this is the case, the molecule is referred to as “polar.” In molecules that consist of atoms of only one element, such as N2, Cl2, I2, S8, or are symmetrically structured, such as methane (CH4) and benzene (C6H6), the charges are evenly distributed within each molecule. These compounds are referred to as “nonpolar.” Nonpolar solvents include gasoline, kerosene, oils, and fats. Therefore, the oil content of a fingerprint makes it possible to temporarily capture iodine molecules in that fingerprint. In other words, the nonpolar iodine molecules temporarily adhere to the nonpolar oils in the fingerprint. Why does the fingerprint discolor so quickly? The color of the fingerprint is determined by the presence of the molecular iodine that binds to the oils in the secretions from the skin. However, these bonds are rather weak – the iodine eventually sublimes. This causes the fingerprint to discolor over the course of about 15-30 minutes. The process we encounter in the experiment is reversible. 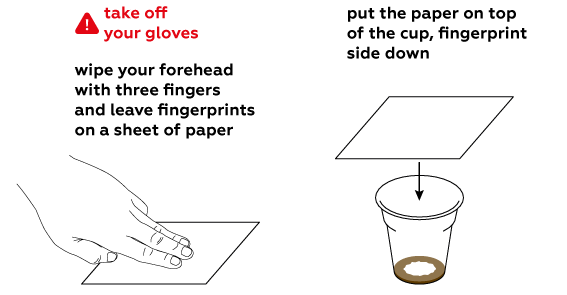 In the beginning, we see that our plastic cup contains a lot of iodine, while the fingerprint contains none. 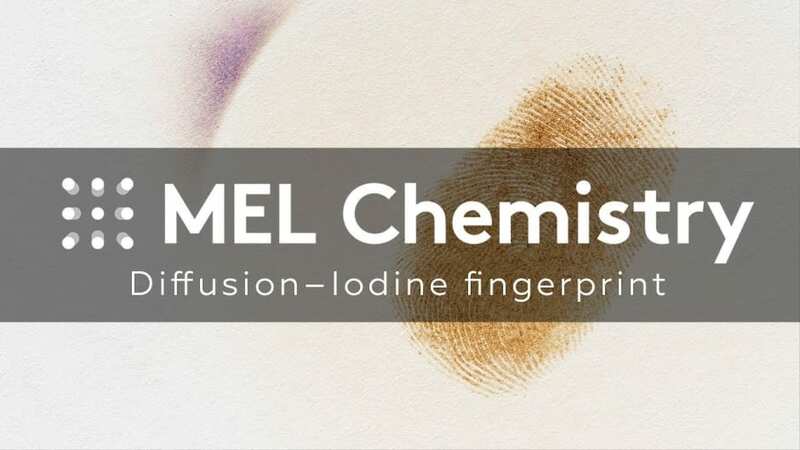 So, during a process called diffusion, in which the particles of any particular substance tend to spread out to more or less evenly fill a space, – iodine molecules enter the fingerprint. Later, when we invariably leave our iodine-infused fingerprint exposed to air (which contains either no or very few iodine molecules), the iodine molecules leave the fingerprint and enter the air, trying to distribute themselves evenly between the air and the fingerprint. But since there is a seemingly endless amount of air compared to the volume of the fingerprint, most or all of the iodine molecules abandon the fingerprint and venture out into the open air. Your fingerprint will eventually undergo discoloration, which is the disappearance of the iodine. The same process can be observed with an iodine stain on clothing; the stain will discolor with time. Iodine is often used as a disinfectant for scrapes and cuts, and many people think that the iodine stain on the skin disappears as the iodine is absorbed by the body. Indeed, a small fraction of the iodine molecules are absorbed, but the majority simply sublime directly from the surface of the skin into the atmosphere. Is there any way to preserve the print’s color? The fingerprint’s color can be preserved by depositing a thin layer of highly reactive carbonyl iron (Fe) powder directly onto the fingerprint. This prevents the iodine from escaping from the fingerprint and returning to the atmosphere; instead, the iodine reacts with the carbonyl iron (Fe). 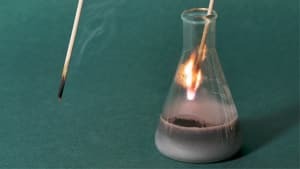 This reaction yields iron iodide (FeI2), which is a stable reddish-brown. Due to its propensity for such reactions, iodine cannot be used to reveal fingerprints on metal surfaces, as it would react with the metal and obliterate the fingerprint rather than reveal it. Iodine fuming has been used to develop fingerprints since the beginning of the 20th century. Though the same basic principles apply, the equipment used to conduct the process has changed somewhat over the years. In the following video, you can observe a variety of tools used by professionals today. Although the equipment does not resemble a traditional camera, the chemistry behind both procedures is the same. Try to reveal fingerprints on a piece of light (best white) cloth instead of paper. Where is the iodine fingerprint revealing method used? This method’s primary advantage lies in the fact that the staining eventually disappears. It usually leaves us enough time to take pictures of any revealed fingerprints before it vanishes. Thus, in some cases, it is an essential (and the only acceptable) method for finding fingerprints. Such evidence as important documents or works of art could be utterly ruined through other fingerprinting methods. However, iodine processing has its own limitations: this method cannot be used on metal surfaces, as iodine reacts readily with most metals. Forensic science, or forensics, is the application of science to criminal and civil laws, usually during a criminal investigation. Forensic relates to a discussion or examination performed in public, as it is a word of Latin origin. Specialists who employ forensic science collect, preserve, and thoroughly analyze any kinds of scientific evidence that could potentially reveal details regarding the crime at hand. Some forensics procedures are conducted directly at the scene of the crime – criminalists search for any clues, fingerprints, traces of blood, and so on. Then, they study any objects of interest they find; most of the action takes place in a laboratory. art forensics – art authentications, detecting and identifying forgeries, faked and copied works of art; bloodstain pattern analysis – the scientific examination of blood spatter patterns found at a crime scene, used to reconstruct what happened and how; digital forensics – the application of scientific methods and techniques to recover data from digital and electronic devices; forensic dactyloscopy – the study of fingerprints; forensic DNA analysis forensic geology – work with trace evidence in the form of soils, dust, minerals, oils; forensic toxicology – the study of the effect of drugs and poisons on or in the human body. There are many more divisions, such as social work, psychology, meteorology, microbiology, and even seismology! Any specific scientific knowledge has the potential to be extremely helpful when investigating a crime scene, both to analyze evidence and to pin down potential culprits. Since there are so many divisions, many forensic specialists possess a variety of skills relating to multiple fields. What other methods can be used to stain fingerprints left on paper? Powders, unfortunately, can’t reveal a crisp fingerprint on paper surfaces. Powder particles adhere to cellulose fibers the same way they do to a fingerprint. 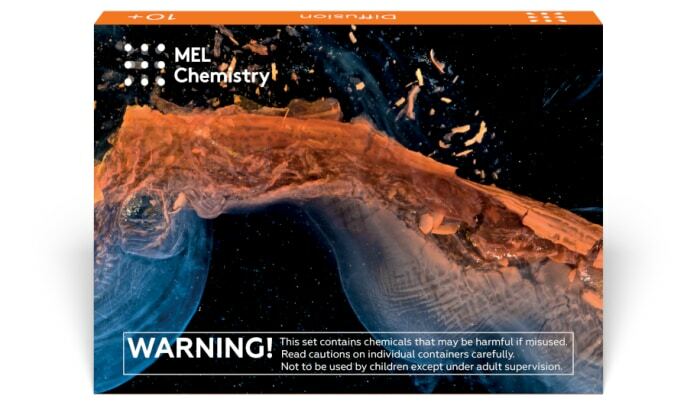 This is why chemical methods are normally used for such cases. Special chemicals react with fingerprint components, making any fingerprints materialize with a lasting color. Let’s consider the composition of fingerprint residue. Such residue mostly contains oils, amino acids, peptides, sodium chloride (NaCl), and water. Interestingly, age and gender seem to influence the composition of fingerprint residue. For instance, infants’ fingerprints may literally disappear with time as they consist mainly of volatile compounds! The residues remaining from their fingerprints are too insignificant to reveal via classical methods (powders or chemicals). Even adults’ fingerprints partially disappear with time. Luckily, sometimes slightly heating a fingerprint is enough to make it more pronounced. But what can we do if such a trick doesn’t work? Detectives found a way! They use a mixture containing approximately 3% fine particles of molybdenum sulfide (MoS2). This mixture usually helps reveal the trickiest fingerprints on smooth surfaces. This method even works on glass surfaces that have been exposed to fire! One disadvantage of this method is that it partially stains the paper as well as the fingerprint. This drawback has eliminated this approach from popular use. It has been replaced by a method known as ninhydrin processing. Ninhydrin (C9H6O4) is a substance that reacts with the amino acids and peptides contained in fingerprint residue. 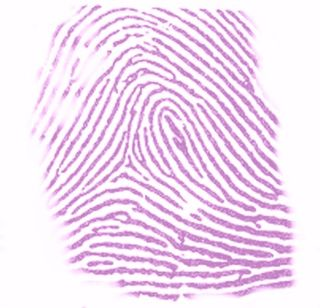 First, a colorless ninhydrin solution is applied, and the sheet of paper is then heated to develop a clear magenta fingerprint pattern.